Of all the shark and ray families, sawfishes are considered to be the most endangered. Sawfishes are large, shark-like rays which inhabit the shallow, coastal waters of tropical and sub-tropical regions. Once common in these regions, sawfish populations have declined in recent decades and sawfishes are now thought to be extinct from many parts of their former range. Coastal fisheries, especially trawling, and entanglement in fishing nets have been central to the demise of sawfishes worldwide. 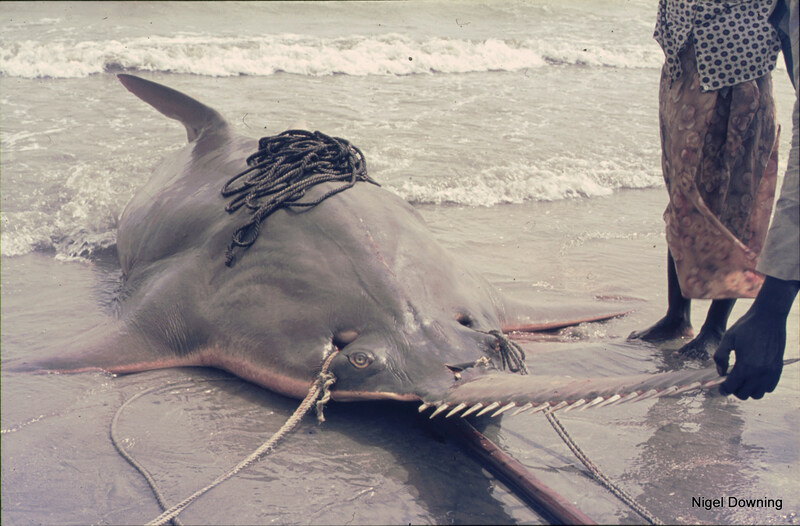 In some areas, sawfishes have also been targeted by the shark finning industry, and the loss or degradation of mangrove and estuarine environments, which are important habitats for juvenile sawfishes, may also have had an impact on populations. Two species of sawfishes, Pristis pristis and P. pectinata, formerly inhabited the east Atlantic, including much of the West African coast. 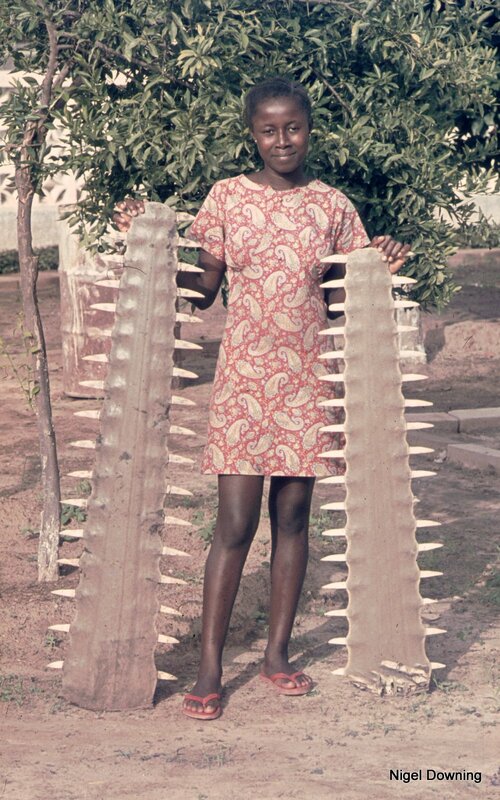 Sawfishes were probably once a common sight in West Africa. Cambridge biologist Budgett (1899), on an expedition to The Gambia colony, wrote ‘…frequently in the morning, when the trammel-net was examined, a Crocodile (Crocodilus cataphractus) or a Sawfish (Pristis perotteti) had to be slain’. Likewise, a Swedish study (Svensson, 1933) carried out in the 1930s suggested that sawfishes were plentiful in Gambian waters: ‘This sawfish is common in the river at all seasons. . . . [I]t was [also] caught in remarkably great numbers, just at the mouths of creeks. It is known by the natives in all parts of the river in the Gambia’. Forty years later, Nigel Downing, then a PhD student at Cambridge University, encountered many largetooth sawfish in the Gambia River. Fishermen working several hundred kilometres upriver in freshwater often caught sawfish, particularly juveniles. At the coast, Nigel also encountered fishermen hauling a 5-metre female largetooth sawfish, pregnant with 15 pups, onto the beach. Between 1974 and 1975, Nigel collected numerous rostra and some complete sawfish specimens, which he brought back to the Museum of Zoology in Cambridge. These specimens will provide an enormously valuable contribution to an ongoing study examining the differences in rostrum structure amongst sawfish species and even amongst regional populations of the same species. Interviews conducted with fishermen in The Gambia earlier this year suggest that sawfishes are no longer a common sight and may in fact be locally extinct. Up-to-date information on sawfish abundance and distribution in African waters is almost completely lacking. This, of course, hampers any attempt to protect any remaining sawfish populations, since we do not know where to focus efforts or what the local threats are. The Protect Africa’s Sawfishes project is attempting to collect baseline data on sawfishes throughout Africa, to assess where sawfish populations still persist and where best we can focus conservation efforts to ensure that these unique and fascinating fishes do not disappear completely from African waters.